Former Prime Minister HD Deve Gowda filed his nomination papers confirming himself as the coalition's candidate from Tumkur in the Lok Sabha elections. 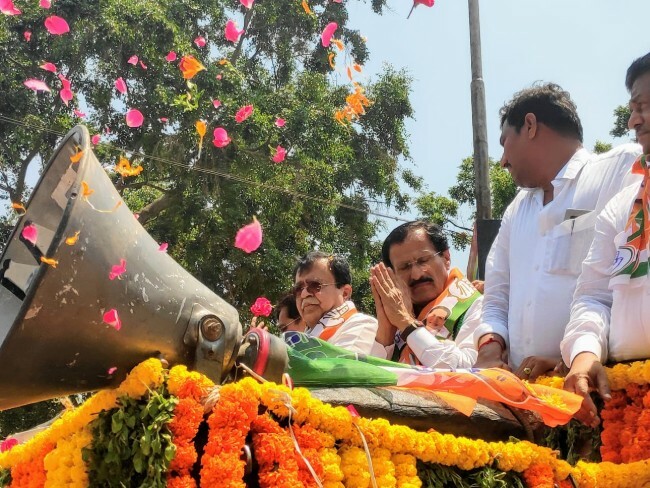 Deputy Chief Minister G Parameshwara, who hails from Tumakuru district was present when Deve Gowda filed his nomination papers, and attempted to play peacemaker between the Congress and JD(S) in the district. "I attempted to persuade Muddahanumegowda to withdraw his candidature. There is no difference between Congress and JD(S) workers. I will persuade him to withdraw his candidature. I am confident I can convince him", he said. For Deve Gowda, the decision to contest from Tumakuru ended weeks of speculation about the fate of his candidature. After he relinquished the Hassan seat to his grandson Prajwal Revanna, reports suggested that Deve Gowda was undecided between Tumakuru and Bengaluru (North) Lok Sabha constituency. Eventually, on Saturday, Deve Gowda confirmed that he would be contesting from Tumakur constituency. "Congress leaders had said I should stand in either Bengaluru North or on the other hand from the Tumakur constituency. All the leaders finally said I should contest from Tumakru. This is the reason I am standing from here. Congress leaders have taken an interest in asking me," he said after filing his nomination. Tumkur was the only constituency handed over by the Congress to the JD(S) as per the seat-sharing alliance struck between the two parties in which the incumbent MP belonged to the Congress party. Even choosing a candidate with the reputation of Deve Gowda has done little to please sitting Congress MP Muddahanumegowda, who has vowed to re-contest from the constituency as an independent candidate. Muddahanumegowda along with a section of local Congress supporters gathered at the Tumakuru Mahanagara Palike and held a procession before filing his nomination. However, several JD(S) supporters in the crowd claimed that there was no injustice in giving the seat to Deve Gowda. "There is no injustice done. They have maintained coalition pact. From both parties we asked him to come to Tumakuru since there are JD(S) MLAs here and Congress Deputy CM Parameshwara is also from here", says Ravikumar, a JD(S) supporter. Moreover, Deve Gowda and the coalition also have to contend with the challenge of the BJP and its candidate and former MP from Tumakuru - GS Basavaraju. "Deve Gowda is not only an outsider in Tumakuru but he also has to answer the people here about the lack of 24 tmc ft water entering via Hemavathi Dam to Tumakuru district. We will contest Deve Gowda and we are confident that the division within Congress and JD(S) will help us", Basavaraju said speaking to TNM. He will file his nomination papers on Tuesday hoping to take advantage of the division between the coalition partners.